Saturday, July 14 was one of the best low tides of the year, and we happened to be in Ninilchik, one of the best places for clamming for razor clams so we had a great couple hours clamming. The weather was perfect--warm enough for short-sleeved t-shirts, which is unusual on the ocean. Of course we overdressed, since it is rarely that warm! We had the odd, long, skinny clamming shovels and a bucket each. Low tide was at 10:10. We got there at 10:30 (had forgotten to get our fishing license the day before, so had to wait in line!). The shore was wall-to-wall people, and we were a little discouraged until we started digging. We found a spot where no one had dug and no one was digging. I was getting a clam in just about every hole I dug, though it took a little experimentation to avoid breaking them while digging or while grabbing for them. Denver found plenty of clams sitting on the surface by a stream that crossed the beach. Doug dug and Aurora grabbed the clams. It helps to have a long arm and strong hands. The clams wiggle to about arm's length deep upon being disturbed, so once the hole is dug we had to get down on our knees and feel around the bottom of the hole for the clam. The shells are actually delicate, so oftentimes in our gripping we would break the shell. They're still edible, just a little more difficult to clean. In an hour and a half we got a 5 gallon bucket full. It then took 6 of us 2 hours to clean them all! Aurora cut off necks and cut them open; Doug and I scraped out the guts inside and scraped them off the shell, while Delores did the final cleaning picking off any bad parts we missed. It took another hour to bread them (flour-egg-saltine crackers), and then just a few minutes to eat them! Yum! Since we sold our second vehicle in Michigan before we moved here, we have been managing all summer with one vehicle, and with Doug beginning his principalship next week, we were down to the wire in finding a second car. All the teachers and anyone who knows his school said he would need a high clearance 4-wheel drive to get to Razdolna in the winter and spring. While our Subaru is AWD, it is not high clearance, so we were looking for a sport utility or pickup truck. Our mechanic recommended getting a Nissan or Toyota truck since they don't break down as much. 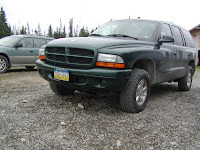 We looked online, in newspapers and at 10-15 car dealerships in Soldotna and Anchorage, and did not find one that was big enough for the kids and 4wd. Prices seemed higher than midwest prices, and were outrageously high at one used car outlet in Soldotna. Minivans are just not the vehicle of choice up here, and we don't see very many of them. We ended up getting an '02 Dodge Durango. It seats 6, has enough space in the back that we can actually go camping with all our gear, has the tow package so we could get a popup or put a rear cargo carrier on it, and basically best fit our needs. Air travel is a common means of transportation in Alaska. While Anchorage, which is 5-6 hours from our place, is the closest international airport, Homer and just about every other little town has an airport. There are airfields in lots of places since there are so many pilots who fly up here. Water airports are very common too. The Alaska Railroad goes up to Denali (known as Mt. McKinley to the uninitiated) and I think Fairbanks. It also goes south of Anchorage to the Portage Glacier. Beyond that I think there is only roads. Many people fly up here and rent RVs or cars. RVs are nice so that one can save on the expense of hotels (which might also be full) and meals in restaurants (which adds up anywhere, but more so in Alaska). Some people also take a boat out of Seward, choosing the inside or outside passage down to Seattle. The crops that I have heard do very well include cabbage (1 per wheelbarrow--prizewinning size! ), broccoli, cauliflower, potatoes, carrots & leafy plants such as spinach, all of which I plan to grow next year. Corn, cucumbers and tomatoes appear to be greenhouse-only crops. I'm not sure if zucchini is indoor or outdoor here. Pea plants grow exceptionally tall, but not bushy. At first I thought this was because they were not healthy, but I realize that with the large amount of light, it stimulates the growth of tall plants. Invasive weeds are a problem, and Alaska has many of them. Horsetail (grows about 1-2 ft. tall & is so named because it is bushy like a horse's tail. It is related to snakegrass), cow's parsnip, fireweed (a beautiful flower, but it can take over), daisy (yep, another beautiful flower that can take over), chickweed (comes from horse manure) and butter'n'eggs (yet another flower) all can become a problem in a garden. Since the field I tilled up was all horsetails that is the weed I'll need to look out for! Even parts of the plant, if broken off, can grow new plants. I now have a garden!! Bill & Stephanie, who we are renting from, suggested it, and I jumped at the chance! I had just emailed a friend and told her the worst part of living in Alaska for me was not growing anything, so it was the answer to my prayer! It's not a big plot, but it will be enough to help me learn what to do, and what not to do! So far I have a composting bin that has straw, alder leaves, horse manure, shredded paper, salmon scraps, and sawdust. The Homer Gardeners handbook suggests using 4 pallets stood upright and tied together to make a compost bin, so we whipped up an economical bin in 10 minutes! Since the area our bin is in is horsetail city, and we don't want horsetails in our compost, we put down heavy duty black landscaping cloth, double thickness, underneath the pallets as horsetail prevention. So far I have put alder leaves, horse manure and chicken manure on the garden, and have managed to completely cover the entire garden with this combination. Since the tiller did not go very deep I will need to dig this into the soil to a depth of 8-10 inches. The chicken manure/straw was actually already composted, as it has been sitting in an unused chicken coop for 2-3 years. I was so excited to actually find a worm, since I haven't seen any since I've been in Alaska. On the Jones ranch there is also goat manure, cow manure, and more horse manure, so I will have as much work as I want getting the soil up to snuff this year. It really needs it. I ran water on the garden for a minute and the water sat there without seeping in for about 20 minutes! And when I stuck the shovel in, it was thick, heavy, goopy muck. Sounds like clay to me! In addition to nutrients, I need to add sand, sawdust and peat to help the drainage. Did I say I have my work cut out for me??!! We have sunk holes in the corners for the fence, but hit roots under one so will have to get some heavy duty equipment to get through them. 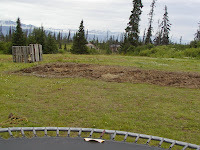 I will keep you posted as I continue my trial and error with Gardening in Alaska! We have discovered a new entertainment: rafting in the local pond. Today was actually (!!) warm enough to wear shorts and a t-shirt outside and be comfortable, so we inflated our Eco-Explorer and carried it down the driveway to the local pond. It is fairly deep, but there are lots of dead trees in it, so avoiding snags developed Aurora and Denver's skill at canoeing. 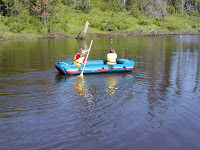 They were proud of themselves to go out in the boat by themselves, and Aurora got proficent at steering. 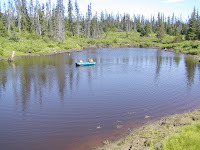 When they got bored with paddling they collected pond specimens to check out under their computer microscope. And then, the most fun of all, was jumping off the raft in the middle of the pond. Aurora had a blast pulling the raft around with Denver and I in it! 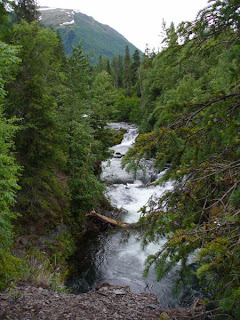 The trail to the Russian River Falls is probably one of the best maintained trails in Alaska. It is a wide 6 feet, gravel the entire 2.3 miles. There are 2 viewing decks overlooking the falls, though many people traverse down the bank for a closer look at the falls and the fish. 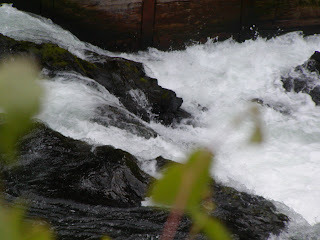 It is amazing to see scores of salmon swimming upstream against the current, against the falls. In shallow areas I could see the fins of fish sticking out of the water. 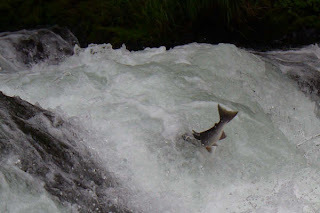 Occasionally a fish will fly out of the water and jump up the falls. Three years ago when we visited the falls we had the fortune of seeing a brown bear wading at the base of the falls, hunting for fish. It looked more like play than hunting as the bear jumped around in the water. There is an entry fee of $8 per day per car to get in to the Russian River Falls parking area. The number of people fishing the river in that area is carefully restricted, so the attendant took our day pass as we left the park. One of the first things I noticed as we drove into Alaska in early June was the amazing number of wildflowers that lined the roads. 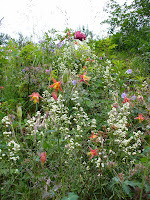 That was a sparse showing compared to the profusion of wildflowers now in bloom. It seems everywhere I look there are lupine, cow's parsnips, wild geraniums, chocolate lilies, coastal indian paintbrush, forget-me-nots, wild roses and more, and yet more flowers. The air is heavy with the scent of flowers. Aurora took all the flower pictures shown here. We have found a new church community in Homer, Alaska. St. John the Baptist Church has 120 families, is very similar to Holy Redeemer’s layout before it was remodeled, and has a basement just like Holy Redeemer, including the steep steps! The biggest difference is that behind the altar is a picture window overlooking Kachamek Bay and the mountains so we can watch boat traffic, birds and the fog during mass! The church is 30 minutes from where we live. It does not have a priest; a nun runs the church and we have mass whenever a visiting priest is available or every other week. The nearest church with an assigned priest is 2 hours away (in Soldotna), and they are the ones who send a priest around to these outlying churches. A retired priest from Montana, Fr. Charlie, has been coming up for a month every summer for 15 years. This was his last Sunday here for this year; he will go to Montana for a visit, and then home to Ireland where he is from. Fr. Charlie visits many of the families of the parish during his month here, and last week he put on a mini-retreat for women that 32 ladies attended. After the lector gives the reading, he has them give their interpretation of it, and then he gives a mini-sermon. Mass is regularly an hour fifteen minutes long. He retired at 65, and is now 80, but still going strong! The parish family greatly appreciates having him for one month of the year. The music is very good. They have two different pianists, who also sing, and a sixteen-year-old girl who plays the violin beautifully. 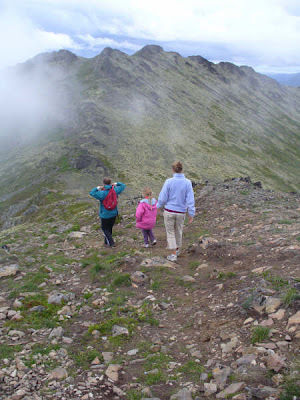 Thursday, June 12 we drove to the mountains north of Soldotna and hiked the Skyline Trail, which is 2 miles round trip, with an expected hike time of 3-5 hours. Aurora had been begging for weeks to climb a mountain, so this was her chance. I'm not sure of the elevation change of the trail, but it is somewhere over 2000' I'm guessing. 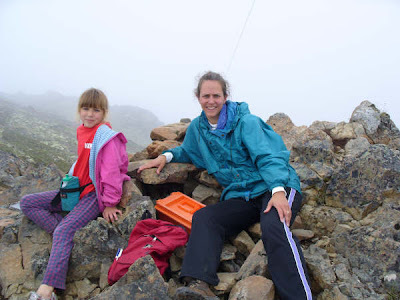 The day we hiked it, the peak was in clouds, so we didn't get much of a view from the very top. It took us 2 hours to hike up, with lots of stops. It was drizzling as we were heading up, and though I was wearing shorts and a sleeveless t-shirt, I was soaked with sweat. Though Doug and I hiked this trail 3 years ago when we were up here, because of the clouds, I was not sure where the official peak was. We wanted to get to the peak more for Aurora than us. A couple of times we would reach a little peak, but when that wasn't the one, kept saying, "Let's go just a little bit further." Finally we got to a spot where Aurora said, "OK! We can go back now!" As I was sitting there I looked up and saw a stake a little ways above us. I said, "I think that's it!" and with renewed energy that we didn't think we had, we pushed to the top and got to sign the book in the orange box....a guestbook of sorts! It took us 1 1/2 hours to get down, and as Aurora said, "My legs feel like jelly!" The trail is fascinating just to watch the change in vegetation from the bottom to the top. It starts out as so lushly vegetated, with plants hanging over the path and spruce trees towering over us. As we got higher there were fewer spruce, then there were no trees, just alders and bushes, and then hitting treeline where vegetation doesn't stand more than a few inches tall. Suddenly a cold breeze sweeps by and it is time to start putting on all the layers of clothes taken off earlier in the hike. Gloves and a hat would have been nice! The trail is a single path, unimproved except for one area where the erosion was exceptionally bad and they put in 10-15 crude steps. Otherwise one must scrabble along as best as possible. Current berries were beginning to ripen at the bottom of the mountain, and about halfway up they were green, and looked like they had a ways to go before they ripened! We have spent the past week (June 9-13) in Ninilchik at the Lindeman Family ranch where they hosted a Vacation Bible School. Alaska Missions for Christ recruits teams from all over the country to go to Alaska for a week and present vacation Bible schools to preschool through 8th graders. The Lindeman's have hosted this the second week of July every year for the past 15 years. This year the team was from Indiana. The teams range from college students to adults. Mission members have to pay for their own airfare, food and the Alaska Missions organization. AMC use the same VBS programs that are used around the country. This year's theme was a western round up. 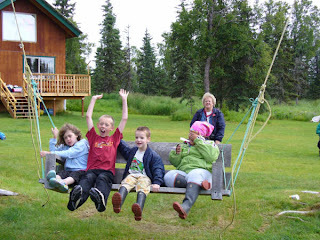 Most of the kids are from the Ninilchik area, but the Lindeman grandkids and other friends of the family end up coming and spending the week as well. There were 30 guests staying at the ranch this week, filling up all the rooms and guest houses, as well as in RVs and a tent (us!). Each day for 3 hours, and additional 50 kids came (for a total of about 60 youth per day) and sang songs, did crafts, rode the horses in the arena during breaktime, and learned about Jesus. On the final day the Lindeman's host a lunch for all the children and their families, serving grilled salmon, hot dogs, chips, and lots of desserts! VBS is an annual event that children in the area really look forward to and come to year after year. The Lindeman's play host to the VBS staff (there were 12 of them this year), taking them on outings in the afternoon and evening after the kids are gone. This year, Doug and I helped out as tour guides. 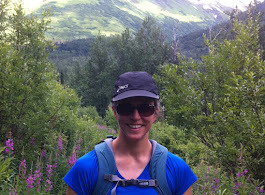 I took a few staff with me on the Skyline Trail hike one day (see another blog post about that. ), while Doug took another group on a tour of Homer. Another day Delores drove with us as we headed to the Russian Falls. The weather was cool and overcast nearly the entire week, but everyone took that in stride and dressed to be outdoors all morning. Luckily, the rain held off. The sports that involved squish water balls were definately not designed for this type of weather in mind! 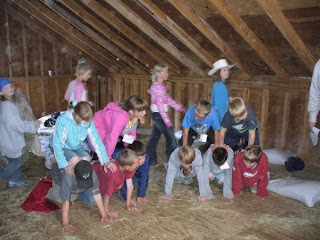 The general format of each day was to have a half hour opening in the pole barn 9:30-10:00(hay bales set up for seating). There was an ongoing story that a couple VBS staff acted out each day, and there were lots of energetic, aerobic-like songs to wake us all up. Each day a child was asked to say the opening prayer (Denver did so one day, and thanked God for "the energetic songs we sing"! ), and then they broke into 4 groups: preschool, 1-3, 4-6, 7-8. The groups rotated among 4 stations, with a half hour break after 2 stations. It ended with a 30 minute closing. Safeway in Soldotna donated all of their day old bakery items, so every day there were incredible treats for the kids at break.